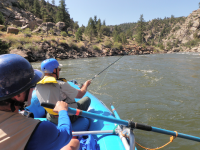 Founded in Breckenridge in 1987, The Adventure Company has earned a reputation for top quality by offering fishing and rafting trips packed with premium features. An emphasis on safety and quality promotes a true sense of comfort, allowing you to enjoy your adventure to the fullest! Choose from fly or spin fishing and count on your guide's expert knowledge. Learn the best techniques, local secrets and land your trophy fish! Ask about combo trips and combine 2 fun outdoor activities.